About two dozen lots of fantastic majolica items are at auction on Friday October 22, 2010 auction is in New York City. Items from the Dr. and Mrs. Sidney Merians collection are included in the auction. 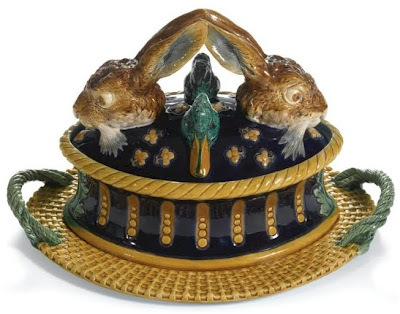 One item from the Merians collection includes a rare Mintons 'RABBIT AND DUCK HEADS' Game Pie Tureen, Cover and Liner. Dated 1876. Description: Attributed to Paul Comolera, the elliptical tureen of waisted form, glazed in ochre and cobalt and raised on a fixed basketweave stand with green rope-twist handles, the cover modeled with two hares' heads and two male mallards' heads, the ears of the hares joining to form the handle impressed MINTONS, date code and shape number 1990.
founded in 1989 with just 45 members, has enjoyed membership of more than a 1,000 enthusiastic individual collectors, dealers, authors and historians from across the globe. Society activities bring these diverse members together to share their collecting experiences and encourages the highest level of interest about this most brilliantly glazed, exuberantly decorated and whimsical ceramic!